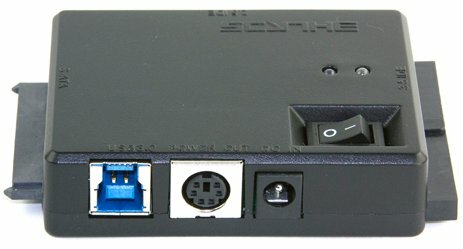 Scythe presents the Kama Connect 3, an adapter kit that makes it possible to connect SATA and IDE devices simultaneously via USB 3.0. The Kama Connect 3 (SCUPS-4000) should be available in Europe for around 33.90EUR (excl. VAT). The new Multi Adapter Kit, Kama Connect 3, provides a "box-full" of neat functions. This adapter kit makes it possible for the user to connect S-ATA and IDE devices at the same time. Furthermore, it comes equipped as power source for additional devices, has a USB 3.0 port and supports Windows 7. Altogether the Kama Connect 3 houses four ports: One USB 3.0/2.0/1.1 Interface, two IDE and one S-ATA port. On top of that, the user can connect an additional device of choice to the built-in power source. On top of that, the user can connect an additional device of choice to the built-in power source. Eliminate the hassle of opening your case, unscrewing and detaching the drives to connect and use it. Kama Connect 3 can be used externally via USB, so simple! Kama Connect 3 Adapter provides users the ability to connect S-ATA and IDE Devices at the same time.